The Sims: Life Stories is a video game, the first game in the The Sims Stories series. The game is a version of The Sims 2 optimized for laptops (and lower-end desktop computers) and bears similarities to the console ports of The Sims games. In Story mode, it begins with the problems of Riley Harlow and Vince Moore. Rewards are unlocked as set goals are achieved. In open-ended Classic mode, the player creates Sims and then choose how they'll live their life through. 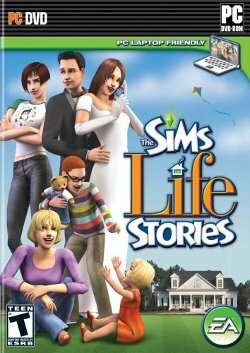 The Sims Life Stories was released on February 6, 2007. It is categorized as laptop-friendly since it lacks the need for an independent graphic card. Currently, two other entries in the series are available: The Sims: Pet Stories and The Sims: Castaway Stories. The game begins in Story Mode with Riley Harlow's life story as she moves from SimCity to Four Corners to live with her Aunt Sharon to start a new life. A second story follows the life of Vincent Moore, a millionaire who is looking for true love. After both stories are completed the gameplay continues in open-ended Classic mode, which is similar in nature to The Sims 2. The Sims Life Stories uses the same game engine and gameplay mechanics as The Sims 2. In addition to the open-ended freestyle mode from The Sims 2, Life Stories features 2 pre-defined scenarios. In each scenario the player takes control of one of two protagonists and is tasked with accomplishing various goals in that character's life. The game features significant use of scripted sequences to create pre-defined dramatic events and situations. As Life Stories was optimized for use on laptops, hardware requirements are significantly lower than The Sims 2. This page was last edited on 16 August 2016, at 15:24.